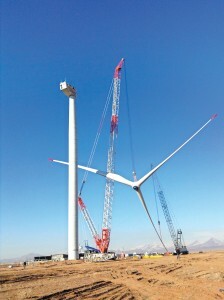 An 800t Zoomlion QUY800 crawler crane has been used to install turbines on a wind farm in Takistan, Iran. The crawler, with a 108m jib and 7m extension, is being used on the Kahak Wind Farm, which is being built to ease the pressure on the power supply in Tehran. The crane is installing wind turbine towers, rotors, blades and housings. The top section of the towers weigh more than 30t, with the turbines almost 100m high and weighing 350t. Kahak Wind Farm is situated on a plateau to benefit from the windy conditions, but this also makes installation more complex, as the top housing has to be installed within a certain period of time to prevent the wind causing the tower to tilt and bend. The high altitude, strong winds and heavy lifting mass means the average installation time for each turbine has been over a month. So far 10 turbines have been successfully installed.